We’re running our Freelance Bootcamp on 6 July at Accelerator and if you’re a creative individual then book your spot! 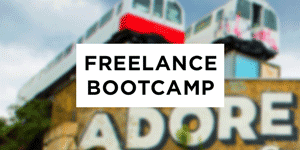 During the full day bootcamp we’ll be covering everything you need to know when starting out as a freelancer. Get all the key info about setting up, finding clients and work, successfully promoting your work and taking care of your finances! Visit the page here to book your spot on our Freelance Bootcamp.